The Grand Dragon is Leh's best-known landmark. The luxury hotel is an enclave of local culture and history. Don’t stress about asking for a room with a mountain view, because the best part of this 76-room property, is that all rooms look out to the beautiful mountains, the high peaks of which remain snow-capped all year around. The excitement is palpable even as the flight nears landing. Peel your eyes away from the mountain range and take in the surreal moonscape of Ladakh. At around 11,562ft above sea level, Leh welcomes most travellers to Ladakh, and the folds of the mighty Himalayas, with fresh, albeit rare, air. Those who don’t fly in, drive up serene, yet sometimes challenging, Himalayan hill roads. Once you arrive there should be just one thing on your mind: rest. This may seem obvious, but acclimatisation to the high altitude, and the low oxygen levels is a must for everyone. Listen to local wisdom and do nothing strenuous for the first 24-48 hours. Seriously. Relaxation, especially when made compulsory is of course best done at a luxurious retreat. 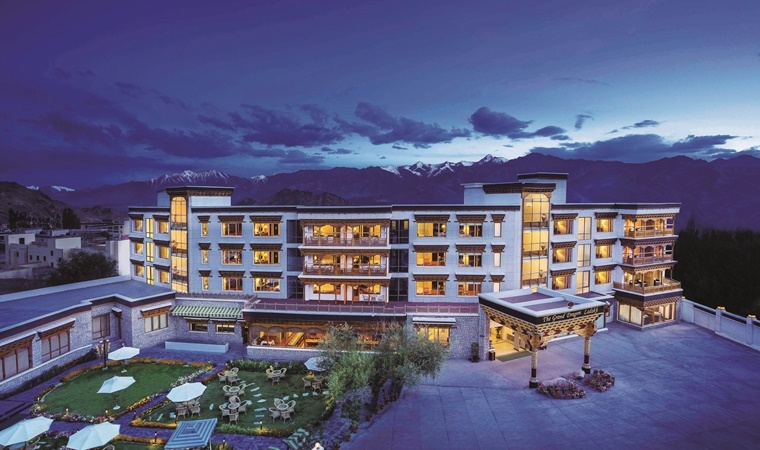 In Leh all roads to luxury lead to the town’s best known landmark, The Grand Dragon. Intricately carved dragons, traditional wood work, the traditional Ladakhi welcome greeting “Julley”, and a white silk scarf, welcome you, and you know you are in for a treat. Don’t stress about asking for a room with a mountain view, because the best part of this 76-room property, is that all rooms look out to the beautiful mountains, the high peaks of which remain snow-capped all year around. Gaze at the changing colours of the skies and hills which change from azure to golden, to blazing red. There is art everywhere, from the signature Ladakhi teak wood cornices, carved wood furniture, and hand painted reliefs in rich colours inspired by ancient decorations seen in monasteries. Take as many photographs as your heart desires. It is nearly impossible to get less than a brilliant frame. The hotel is an enclave of local culture and history, with elements of traditional crafts reflected in the teakwood flooring, and even the upholstery. The heritage suites will take your breath away with their poplar wood ceilings, and traditional hand painted furniture. In fact, there is art everywhere, from the signature Ladakhi teak wood cornices, carved wood furniture, and hand painted reliefs in rich colours inspired by ancient decorations seen in monasteries. 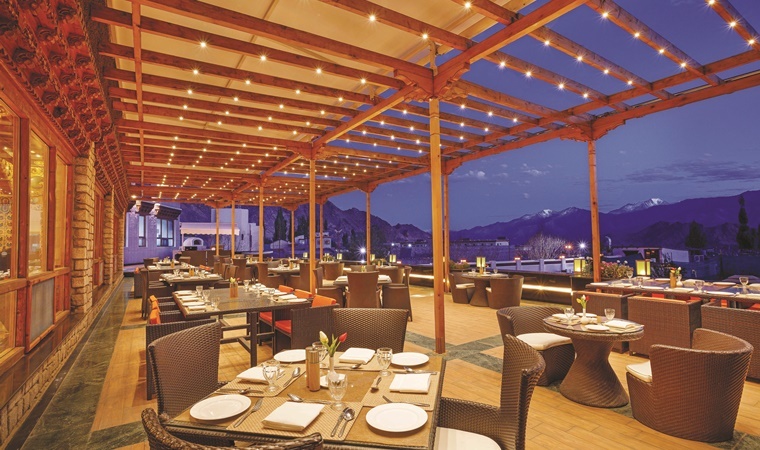 Satiating hunger pangs is best done al fresco on the restaurant’s terrace which is the perfect place for summer meals even as your eyes devour the majestic Stok mountain range. Start with a with a steaming bowl of mountain garlic soup, said to help combat altitude sickness. Delicious and hearty this is second only to thukpa, the Tibetan noodle soup. In fact, you can ask, in advance, for an authentic Ladakhi meal experience and the chefs will curate one for you. Tibetan mutton shapta mopped up with tingmo a fluffy steamed bun and are a must have. The grilled trout too is a must try, as is the Yak cheese, which is umami rich and goes well with all meals. And if you see anything with apricot and Leh berries, order a large helping. The Grand Dragon is an ideal, uber luxurious base camp from where you can make day trips to see Ladakh’s ancient monasteries, high roads and lakes. A full stomach may warrant a nap, but if you are up to it, walk a few minutes to the main market. A must buy is the pashmina from Looms of Ladakh, a local women’s corporative that sells the softest woollens you have ever caressed. 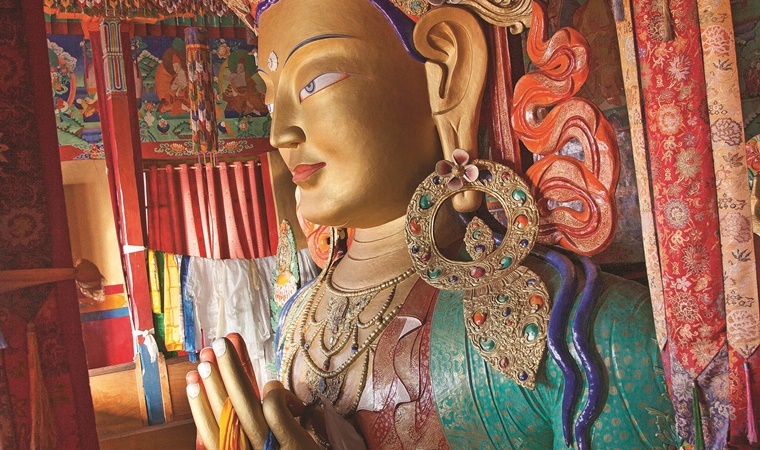 Look out for coral jewellery, woodwork, colourful masks, singing bowls and prayer wheels. The Grand Dragon is an ideal, uber luxurious base camp from where you can make day trips to see Ladakh’s ancient monasteries, high roads and lakes. Just let the concierge know your wish list and a customised itinerary will be curated. Make sure you visit the Shanti Stupa, the Hemis, and Thiksey Monastries, all a short drive away. * By road: From Srinagar, via Srinagar-Leh road (434km); from Himachal, via Leh–Manali highway, (473km).